WASHINGTON — A bill that was passed by the U.S. Senate in early August and is currently under consideration by the House would mandate that the National Aeronautics and Space Administration (NASA) work closely with the Israel Space Agency (ISA) despite the fact that such cooperation in the past was used by Israel to steal U.S. state secrets. The provision is tucked within the bill titled the “United States-Israel Security Assistance Authorization Act of 2018,” which would also provide Israel with $38 billion in U.S. military aid over a ten-year period, the largest military aid package in U.S. history. MintPress News previously reported that this massive aid package translates into approximately $23,000 every year for every Israeli family. However, the provision pertaining to NASA has largely gone unreported. Absent, however, from the bill’s text is the fact that the ISA has used this cooperation in the past to steal classified U.S. information and to conduct espionage. For instance, a lawsuit filed in November 2014 by physicist Dr. Sandra Troian detailed how an Israeli postdoctoral student at Caltech, Amir Gat, blatantly violated U.S. law by illegally transmitting to Israel classified information on NASA technology. According to court documents, the theft of classified information took place at Caltech’s Jet Propulsion Laboratory, an important NASA research and development center. Gat now lives in Israel and works at ITT, an Israeli government institution. Yet, instead of attempting to stop the espionage, Caltech administrators sought to silence Troian, in violation of the school’s whistleblower policy, and retaliated against her for speaking up, including engaging in efforts to have her fired. Troian maintains that the school was afraid of taking her concerns seriously, as it would have put the university’s $8 billion contract with NASA at risk and cast the institution in a bad light. Also of note was the fact that the Obama administration showed no interest in the case despite its repeated use of the Espionage Act to target legitimate government whistleblowers. However, as the Trump administration has shown, the “national security” of the U.S. and of Israel have become profoundly intertwined, as President Trump’s campaign promises of “America First” quickly devolved into “Israel First” — thanks largely to the influence of Trump’s largest donor, Zionist billionaire Sheldon Adelson. Thus, concerns about Israeli espionage seem to be of little import to the current administration as well as to many members of Congress — particularly those greatly influenced by powerful organizations of the Israel lobby, such as the American Israel Public Affairs Committee (AIPAC). Yet, failure to prevent or punish Israeli espionage in the United States has long been a common policy in Washington that significantly predates the Trump administration. With the notable exception of former U.S. government contractor and Israeli spy Jonathan Pollard, the Israel lobby and pro-Israel billionaire donors have been largely successful in obtaining presidential pardons or lenient sentences for alleged Israeli spies. A clear illustration of this double standard is the case of Colonel Lawrence Franklin, a case that clearly illustrates that espionage, when conducted by Israel, is not treated as seriously by the U.S. government as other cases of espionage. Franklin, a former employee at the U.S. Department of Defense, pled guilty to espionage in 2006 for giving classified information to the American Israel Public Affairs Committee (AIPAC), as well as directly to Israeli officials, in an attempt to pivot U.S. military forces engaged in Iraq towards Iran. The Bush administration successfully pushed the Justice Department to pardon Franklin’s co-conspirators and then pushed Justice to reduce Franklin’s 13-year prison sentence to 10 months of house arrest. Subsequently, members of U.S. Congress asked Obama to pardon Franklin in 2016, asserting that “his [Franklin’s] intentions were to save lives and protect this great country” despite the fact that Franklin had sought to involve the U.S. in a war with Iran in order to benefit Israel. Thus, the current NASA provision in the United States-Israel Security Assistance Authorization Act of 2018 would ostensibly continue this practice of “turning a blind eye” to Israeli interference and espionage in the United States if the bill is passed in the coming weeks. 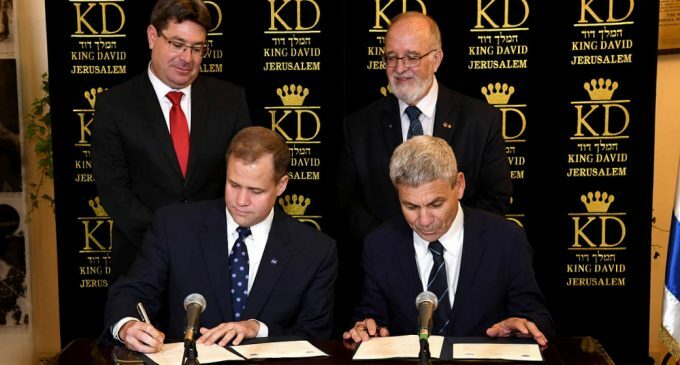 The post Bill Would Force NASA Cooperation with Israel Despite History of Israeli Espionage appeared first on MintPress News.